Boursin Turkey Stuffed Zucchini Boats are delicious (thanks to cheeeeeese) and easy to throw together with just a minute of prep work! This is one of those no-fail recipes. Any time ground meat is involved, you pretty much can’t screw it up. I really wanted to make something that was not tomato based, as many ground meat recipes are. I like tomatoes but just wanted something different! The result was amazing. 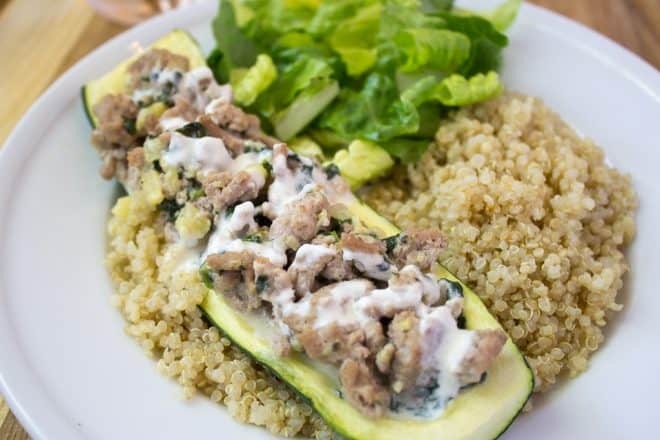 We’ve already had these Boursin Turkey Stuffed Zucchini Boats twice in the past few weeks! I like to cook the filling during nap time and then bake it at dinner time, but it’s simple enough that you could do it all at dinner time. I like to serve them over rice or quinoa. My toddler LOVES quinoa so that’s what I made this time. Do what ya feel! Using a small spoon, hollow out the inside of each zucchini half, leaving a 1/4-inch thick shell. Finely chop the scooped out zucchini flesh. Chop 1-2 handfuls of spinach. Set aside. Brown turkey in a large skillet, breaking it up while it cooks. Add chopped zucchini flesh and spinach. When cooked through, lightly season with salt and pepper. Remove to a bowl. Add package of Boursin, chicken broth, and lemon juice to skillet over medium low heat. Stir until creamy and smooth. Remove about 1/4 cup of sauce to set aside. Then add in fresh basil (or dried). Bake empty zucchini boats in baking dish for 5-10 minutes to soften before filling. Meanwhile, return turkey mixture to skillet and coat thoroughly with the sauce. Remove from heat and let sit for 5 minutes. Then fill zucchini boats with turkey mixture. You will likely have some turkey that won't fit. You can either pile the zucchinis higher so they are somewhat overflowing, or keep the turkey on the side and add it to the dish when serving. Bake 15-20 minutes, until zucchini is tender. Remove sauce from heat, mix with turkey mixture. Let cool. Refrigerate in a bowl until ready to bake. Preheat oven to 350. Bake empty zucchini boats 5-10 minutes to soften. Fill each zucchini boat with turkey mixture. Bake for 20 minutes or until turkey is heated through and zucchini is tender. To serve: Garnish with a drizzle of the reserved cheese sauce. Serve over quinoa or rice. If you like this recipe, try my Paleo Skillet Pizza Shepherd’s Pie!